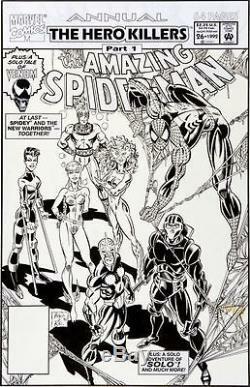 Mark Bagley and Randy Emberlin The Amazing Spider-Man Annual #26 Cover Original Art (Marvel, 1992). The New Warriors guest star in the Hero Killers Part 1 Fortune and Steel. 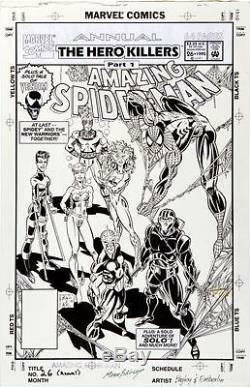 Spider-fan fave Mark Bagley fills this character-rich masterwork with impeccably designed detail. The image area measures 9.75" x 15" and the cover includes the original title and type paste-up art. Signed in the lower border. Check out my other items for more CBCS, CGC and comic book art. The item "AMAZING SPIDER-MAN ANNUAL 26 COVER ART BAGLEY" is in sale since Wednesday, March 25, 2015. This item is in the category "Collectibles\Comics\Original Comic Art\Covers". The seller is "utsbishop" and is located in White Plains, New York. This item can be shipped to United States.